In case you haven't noticed—maybe you're waking up from a coma or just returned to civilization after deciding to go off the grid for a spell—virtual reality is a pretty big deal right now. The VR bandwagon is bursting at the seems with so many players on board, though most of the solutions up to this point have focused on the home consumer. That isn't so with MSI's new WT72, a system it's pitching as the world's first professional NVIDIA VR Ready mobile workstation. Nvidia's VR Ready program is largely a marketing play to help buyers identify systems that meet a certain set of requirements to "deliver an optimal VR experience." For laptops, Nvidia's VR Ready requirements call for an Intel Core i7-6700HQ or greater processor, GeForce GTX 980 or higher GPU, 8GB+ of RAM, three USB 3.0 ports, HDMI 1.3 output, and Windows 7 SP1 64-bit or higher. MSI's mobile workstation goes above and beyond the requirements by pairing Nvidia's Quadro M5500 GPU with Intel's 6th Generation Core i7 and Xeon processors and up to 64GB of DDR4 RAM. There are three configurations to choose from, all of which cost a pretty penny. All three feature a 17.3-inch display, 256GB solid state storage (2 x 128GB in RAID 0) + 1TB HDD, Killer Gaming Network E2400 LAN, Blu-ray burner, memory card reader, six USB 3.0 ports, and a 9-cell battery. All three are Autodesk VRED certified and compatible with existing VR systems, including the two top dogs, Oculus Rift and HTC Vive. 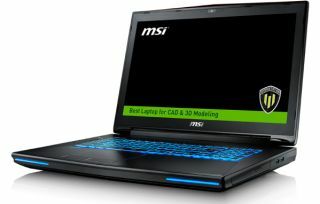 MSI will have its new mobile workstation on display this week at the GPU Technology Conference, but didn't say when buyers will be able to pick one up.